What great news! The fall 2006 draw results were out. When I checked online, we learned that Sam got drawn for the Unit 6A antlerless youth elk hunt. When the draw results come out, about the first thing thing I do is send emails around to all my buddies announcing my hunt results and asking about theirs. Come to find out that Mark’s daughter Audrey was also drawn for the same hunt (I didn’t know they put in), along with the kids of several of Mark’s SoDak buddies. 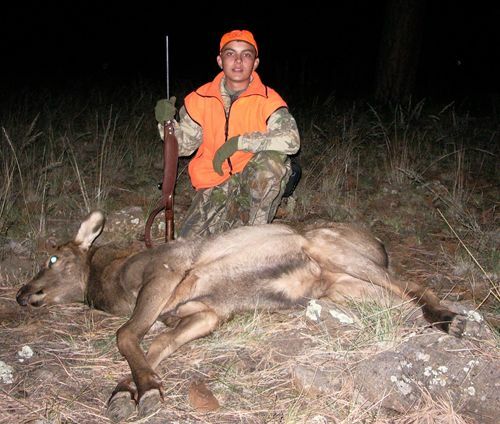 We had hunted the 2005 kids’ deer hunt on the Kaibab with Mark & Audrey and Mike & Ryan. I had hunted before with Rick, but not his son Josh. It looked like we would have another big hunt camp this year. The first order of business was deciding on the primary hunting tool. 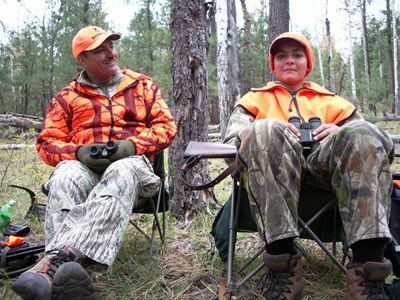 This decision can be tricky for a kids’ elk hunt. On the one hand, for elk you want a gun with plenty of hitting power. On the other hand you want a gun that’s not gonna knock the kid holding it silly. What we settled on was a Marlin .30-30. I loaded up some full power loads using the 170 grain bullet. Good size hole, reasonably heavy bullet, kid tolerable recoil. Over the late summer leading up to the hunt, we made several trips up to 6A for combined scouting, sighting-in, and practice. We also attended a junior elk hunt seminar in Mesa. One of the speakers was the Game & Fish wildlife manager for units 5 and 6. He told us that at the time of the hunt, the elk would still be in the higher ponderosa country – not to bother hunting the lower PJ (piñon-juniper) country. Another thing he said was that they surveyed something like 1500 elk in the unit – 1000 of those were on Mormon Lake! Well you know that this really got the gears turning! We started cooking up plans to get Sammy out on the meadow in the dark before dawn under a big sheet of burlap. Then when the lights came up, he could make a ghillie-crawl under the burlap to get within range for a shot. Sounds like a great plan, but ultimately, we shelved it because of safety considerations. This might be a great plan during the archery hunt, but you don’t want bullets flying across this huge flat, not only for the safety of the hunter, but also for the safety of the settlements that ring Mormon Lake. If you kept your shots pointed toward the eastern cliff, it could still work, but the safety problem for the hunter from other shooters still remains. I always like to take a backup gun on hunts. You never know. So with the hunt less than a week away, I dug into my handloading books, and into my stash of 6.5mm bullets, and cooked up 20 rounds of .260 Rem. with a 140 grain bullet at max-velocity for Sam’s Browning Micro Hunter. As Mark mentioned, Sam and I arrived at the appointed hunt area first on the day before the opener, and staked a claim to a camp site. After setting up camp, and while waiting for the others to arrive, we figured that we ought to take a couple shots with the Micro Hunter to see where this new load printed. We set up a target at 75 yards, and Sam squeezed off a couple rounds. To our delight, the load printed exactly where the crosshairs pointed with no tweaking necessary. About mid-afternoon, the others started arriving and soon the camp was bustling with activity. Later that evening, as Mark also mentioned, we headed to Happy Jack Lodge to get a free dinner at our second youth elk hunt seminar. Opening morning came too soon for this habitual late riser. Sam and I were the last ones out of camp, so had last choice of direction to head off. I don’t think we got a quarter mile out of camp when all the shooting started! Sam and I looked at each other and had the same thought: Oh, no – Audrey’s shooting an elk! You see, on last year’s Kaibab kid’s deer hunt, also where three boys and one girl had tags, only the girl tagged out, early on opening morning! We did not want to see a one-year-later replay of that scene! After a while, the shooting died out. We hunted around for the rest of the morning without seeing anything. When we got back to camp for lunch, we learned that yes indeed, Audrey had gotten her elk, and that Audrey and her Dad were away dropping off the elk at the meat processor’s refrigerated trailer near Happy Jack Lodge. The rest of the hunt day was uneventful for Sam and I. We got to hear the first hand story from Mark and Audrey later that evening. All the shooting we heard that morning was several different hunting parties, there were quite a few in our area, shooting at the herd. That poor herd was running back and forth, up and down “The Ridge” getting shot at from every which way they turned! Sam and I got to hunt The Ridge the next morning. Today though, Sam decided to hunt with the Browning instead of the Marlin. As it would turn out, the Marlin didn’t come out of its gun case for the rest of the hunt. After stalking The Ridge north for about a mile without seeing anything, we crossed over the main north-south road to explore an area to the northwest of camp. As we were walking along a rough forest trail, Sam drew my attention to our right about 25 yards. There was a bobcat sitting there, still as a statue, with gaze focused on … something. Not us. The bobcat was oblivious to our presence. As we watched him, we saw him pounce forward a few feet – then again, then again – still unaware of us. After about 5 minutes of watching the cat, I gave Sam the go ahead to take him. I was carrying Sam’s shooting sticks, so I opened them up and placed them in front of him. At that moment, the cat’s front leg and chest area were behind a small tree, but his head and neck were clear. And that’s exactly where Sam hit him. This reinforced the confidence that Sam already had in the Micro Hunter, the rifle he used to take his Kaibab doe in 2004. I guess we spent about the next 30 minutes or so getting the cat’s pelt off. We were impressed by how soft and luxurious the fur feels. The cat was the talk of the camp that day, as no other elk were taken. There was also talk around camp that evening of Mark and the others sticking around for only one more day. Sam and I were prepared to hunt through Tuesday. After that, I needed to get back home to start making preparations for my deer hunt which started the next weekend. After hunting around camp on foot for two days, on Sunday, day three, we were ready to extend our range a little. On waking, we loaded our packs, a lunch, and Sam’s rifle into the Polaris Ranger and headed off to the north end of The Ridge about a mile-and-a-half away. On this day, we would finally get to see some elk! Our walkabout at the north end eventually led to a wide, open park. As we reached the edge of the trees, we spotted a large herd. But they were on the move! We tried catching up to them, but the closest we could get was about 200 yards away. They kept moving quickly, and there were just enough trees between them and us that we just could not get a shot set up. Finally, we lost them. But we really had some excitement for a while there, running along a ridgeline trying to get into an intercept position. After losing them, we went back to investigate the area that they seemed to be coming from. We found a big tank at the lowest elevation in the park. We decided to set up here for a while, about 200 yards from the water, in a small grove of pines up a draw that fed down to the tank. I don’t know – I guess we had been sitting for about an hour – I had started to doze off – when Sam prodded me back into awareness. He had spotted some hunters coming down the wide draw toward us. Soon enough, we realized that it was Mark, Rick & Josh! We waved them on over. They had the great news that Josh had taken an elk earlier that morning up the draw and around the corner. So that’s why the herd we had seen was moving so quickly! We had never heard a shot. Josh was just beside himself with excitement. Mark said that since he and Bob had such a hard time loading Audrey’s elk into the back of Bob’s truck the other day, he wanted to borrow the trailer I use to haul the Polaris, since it had a much lower deck. But of course! I handed over the keys to the hitch lock and the tailgate padlocks. After the boys left, Sam and I ate our lunches, then hung around the area for the rest of the day. We expected to see Mark and the boys sometime in the afternoon when they came to pick up the elk, but we never did. As darkness came upon the day, we headed back to the Ranger and started driving back to camp. On our way, two elk crossed the road ahead of us, dark shadows in the almost-night. There was not enough light left to chase them, though we were probably still barely within legal hours. Getting back to camp was a real downer, as everyone else had cleared out. The trailer was there, but with some blood on the floor. There was a note and the trailer keys on the table inside our screen-house kitchen. The note thanked us for the use of the trailer and wished us good luck. After the great company of a raucous hunt camp for the last three nights, camp felt a lot different now – kinda sad, kinda lonely. Two hunters had tagged, we still had not. On the topo map, there are four tanks shown to the north of camp, arrayed in an arc, ranging from 1¼ to 1½ miles away. We had already visted two of them, so we picked one of the others to check out on Monday morning. We sat the tank, back to back, so that we could watch both approaches up and down the draw. The woods also felt a lot different today. Not only did our hunt partners leave on Sunday, but so did most of the other hunters that we had been bumping into all weekend long. The woods were a whole lot quieter. We had no action by lunch. That left us with one more tank to check out after lunch. We parked the Polaris about a quarter mile away from the last tank and walked in as quietly as we could. The plan was just to sit this tank for the afternoon. To enhance our comfort, we grabbed a couple folding chairs out of the Ranger’s trunk before taking to foot. We found a nice spot to set up our chairs behind a big log with a small wooded cliff behind us. We were about 200 yards from the tank’s dam. This tank was also located in an open park area, but we were set up back among some trees. We had a great time joking around (trying to do so quietly! ), and just having some great father & son bonding time. But alas, by the time five o’clock rolled around, there was absolutely nothing going on. With about one hour of light left in the day, I told Sam, “Well if nothing’s happening here, we need to find where the action is happening.” What was playing in my mind was the scene of those two elk the night before, on the move at last light. My plan was to slowly walk further down the road we came in on, when we walked in to this tank. When we got back to the road, we stashed the chairs behind a nearby log instead of taking them back to the Ranger. We were walking eastward along the base of a plateau to our north, through a thick patch of trees. We were paralleling an open swale to our south that fed down to the tank we had been sitting. After walking about 20 minutes into increasing darkness, I whispered to Sam, “You know, I would be real surprised if we didn’t see an elk on this walk.” The conditions for an elk sighting seemed perfect. Because we were walking very carefully, swiveling our heads in all directions, it took us just about 45 minutes to travel a half mile, where we came upon a fence with a gate across the road. It was now the very last light of the day. I told Sam, “Well this is it, bud. This is as far as we’re going. We’re just about out of light, so it’s time to head back. Let me just take a waypoint on the GPS so that I can see where we ended up.” So I stood next to the gate, turned on my GPS, and started waiting for it to get a satellite-lock. Sam pointed across the fence, where about 200 yards away, a herd was grazing peacefully behind some trees. I quickly stashed the GPS, and we carefully opened and went through the gate. We went a few more yards down the road where we got Sam set up on the sticks in a kneeling position. Moments later, an elk walked into the window, the short rifle boomed, and the elk hit the ground like a sack of potatoes! Awesome! When we got to the elk, a finisher was needed. It was a small elk, a yearling – about the size of a young mule deer buck, I would say. That takes nothing away from the accomplishment. We were hard against the last possible light of the day. There was no time left to be picky. We measured the shot the next day at 140 yards. By the time we got done taking the trophy photo, it was fully dark. We both had our headlight flashlights in our packs. Earlier in the hunt, I had told Sam that there was a very good chance that we would need them. We got out the knives and the parachute cord and got to work. Sam was eager to dive into (!!) the chore, and he did great. The bullet entered right behind the front shoulder, then took a turn northward, nicking the spine from below, which accounts for the instant smackdown. I’m sure glad that we did not have to track the animal in the dark! Just as we were wrapping up the job, we heard a coyote howl nearby. Sam decided that he was going to stick with the elk to guard it in the darkness, while I hiked the ¾-mile distance to fetch the Ranger. I’m not sure that I would have been brave enough as a 12-year-old kid to do that. I suppose having a trusty rifle in your lap makes all the difference! The elk was light enough that with me on the front legs, and Sam pulling on the rear, we were able to easily lift the elk into the Ranger’s somewhat high cargo bed. After a late dinner, we hung the elk and skinned it. Then, after all the rest of the camp chores were complete, we enjoyed some milk and cookies. What a great night around the campfire that was! In recognition of his first field dressing, I surprised Sam by presenting him with a three-blade Browning Model 828 hunting knife, just like his Dad’s. We ended up hitting the sack at 1 AM. Related story: "Audrey’s First Elk Hunt"